A bit dramatic perhaps, but as of March 27, 2018, only one Georgian Bay lighthouse has been granted Heritage Status, leaving the rest to an uncertain fate (click here to find out what’s going on.) Most Georgian Bay lights have been nominated for heritage status, but government deliberations are still ongoing and their fates were supposed to have been determined by May 29, 2015. Three years later we have no news, although the light and additional structures on Hope Island have been torn down. The Parks Canada official list of Heritage Status lighthouses can be found here. Latest Update (March 27, 2018): To say that things are moving slowly is an understatement. Most Bay lights remain nominated, but only Snug Harbour to date has actually been granted Heritage status. 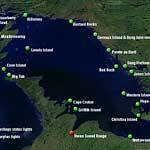 Hope Island has been cleared of all structures, and the Archipelago is still in discussions to assume control of Pointe au Baril. Read the full Heritage Canada The National Trust media release here. Update (February 1, 2014): New colour-coding added to the tracker, to reflect surplus, nominated, and heritage statuses. 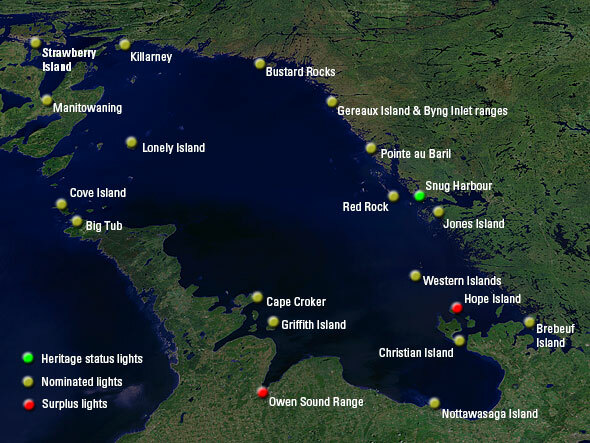 Update (May 22, 2012): Brebeuf Range, Byng Inlet Ranges, Cape Croker, Christian Island, Gereaux Island, Hope Island, Lighthouse Point (Big Tub), and Nottawasaga Island have all been nominated for Heritage Status! Update (May 14, 2012): the Bustard Rocks light and twin ranges have been nominated for Heritage Status. Update (May 7, 2012): Heritage nomination for Bustard Rocks is pending. 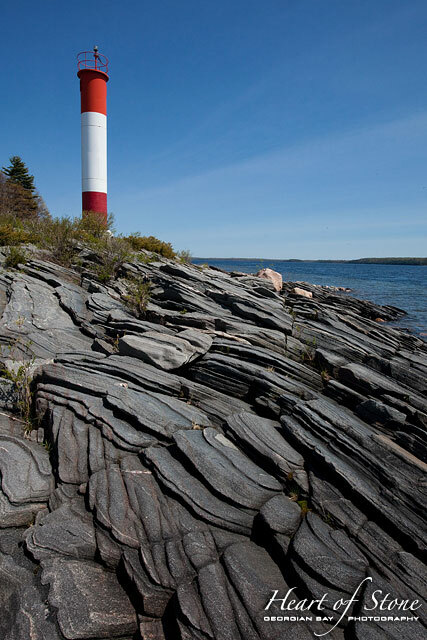 Update (May 1, 2012): No new Georgian Bay lights have been nominated for Heritage Status. Update (April 19, 2012): Killbear Point (in Killbear Provincial Park) and the South Baymouth ranges have been nominated for Heritage Status. Above: Heritage status of major Georgian Bay lights as of March 27, 2018. This entry was posted on Wednesday, November 6th, 2013 at 8:11 pm. It is filed under Uncategorized. You can follow any responses to this entry through the RSS 2.0 feed.